I discovered Nettle’s Tale when their Indiegogo campaign video flooded my FaceBook page back in April 2014. When I pressed play I was more than impressed, I fell in love for the Nettle’s Tale story. After starting my blog and featuring small businesses local to me, I had a few friends encourage me to reach out to Nettle’s Tale to share their story. Soon after that I reached out to Julia, founder and swimsuit designer for Nettle’s Tale, and was thrilled that she was interested in having me feature her small business. Nettle’s Tale is an outstanding small business that does more that just cater to their customers needs, they help their customers to be confident and love their bodies inside and out. Julia is a very passionate individual, especially in the areas of entrepreneurship and the arts. It is evident that she is extremely talented and has a great eye for fashion, colour, and design. Julia has surrounded herself by like minded individuals that make up the Nettle’s Tale team, I very much enjoy the way that she has described them. Nettle’s Tale started with five original swim suit designs, inspired by five woman in Julia’s life. These woman are so dear and special to her and include her mother, roommates, and closest friends. Though, Julia said, “What’s exciting is that as the company grows, the women we are able to include will evolve and change.” In the Spring of 2015 Julia has added three brand new designs. Julia shared that she always knew that she wanted to start her own business. She knew that she would get there, with the right idea, at the right time. The concept that Julia has created, allowing women to feel remarkable while wearing their swimsuit, is extremely valuable to every women. 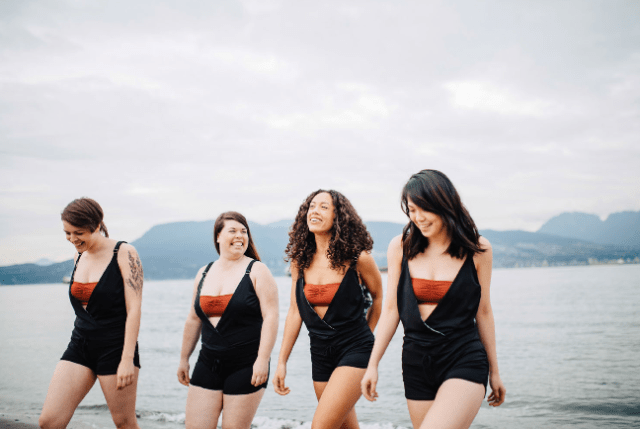 One of the first swimsuits that Julia made was for her roommate, after her roommate tried on the swimsuit and loved it, Julia thought, “Why don’t more apparel companies care about the way their product makes a customer feel?” This was the moment that it all clicked for Julia, she was going to do that, create swimsuits for the everyday Canadian woman. Nettle’s Tale speaks a strong message to women. They share a strong message to appreciate yourself and be confident in the skin you are in. Julia recognizes that all woman are made differently and has created gorgeous swimsuits to show off every unique woman’s figure beautifully. It is a delight to see the growth and support that Nettle’s Tale has received along the way. Nettle’s Tale currently runs out of a showroom and is opening a store front location in Mount Pleasant this summer. Their showroom is a place where woman can enjoy a group shopping experience or if preferred a true one-on-one experience, creating a confidence-building fun environment. Julia has been able to create multiple styles of swimsuits and an expanding clothing line that empowers women of all ages and sizes, making them truly confident in their skin. Her team of ladies is driven to provide their customers with the best shopping experience and is continually looking for feedback on what you think. Julia and her team are so very thankful for the support they have received and they continue to give back with every swimsuit purchase. The ladies who inspired the designs have each chosen an organization they are passionate about. These organizations receive 10% of the profits when someone buys one of their swimsuit designs. Currently, the organizations that are being supported include; Anvil Island Summer Camp, Dalit Freedom Network, Canadian Mental Health Association, Scribble me Silly Art For Kids, and Servants Anonymous.